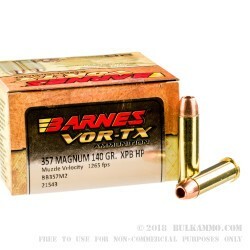 An ultra-premium .357 Magnum round that is made for hunting and self-defense that delivers a heavy payload that is all copper and made to stop the target the first shot. 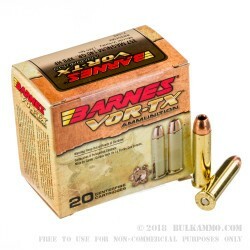 Most of the hype around this particular load involves the monolithic copper bullet build, but there are many redeeming qualities to this cartridge by Barnes. 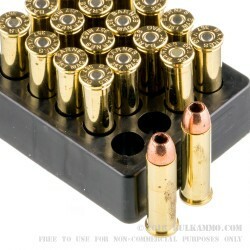 Namely, the premium powder, which offer extremely low flash and super mild recoil given the massive velocity of 1265 feet per second at the muzzle. The brass casing and Boxer primer are also top tier components that allow for easy reloading and consistent velocities and reliability, which contributes to accuracy and overall functionality. 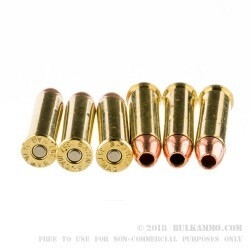 The bullet is the star of the show though, with the all copper projectile offering incredible penetration and significant power delivery at impact which offers excellent stopping power in a round that is equally adept at personal protection and at hunting. The 140 grain load offers milder recoil than the other rounds available on the top end of the market and the resulting faster follow shot makes this a performer in the personal protection scenarios. A better penetrating round with a larger grain weight retention and the massive expansion of the bullet means this is a legitimate target dropper.